Visit the most significant landmark of Florence, the magnificent cathedral Santa Maria Del Fiore, also called Duomo by the florentines. The construction started 1296 and the church was first ready in 1436. The tile roof is designed by Philippo Brunelleschi and is still today the largest tile roof in the world. The roof top can be visited, walking up the 463 stairs to enjoy the amazing view over the capital of Tuscany. The sacred museum of the Dome holds some of the most valuable sacred arts in the world by Michelangelo, Donatello, Brunelleschi, Ghiberti, Giotto, Della Robbia, Andrea Pisano and many more renaissance artists. In front of the cathedral there is the ‘Battistero’, a tiny baptistery, that dates back to 12th century, built on top of a pagan temple. The baptistery has doors made of bronze, illustrating the bible stories, designed by Andrea Pisano and Lorenzo Ghiberti (today replaced with copies). Most famous of the doors is called “Gates to Paradise”, as Michelanagleo used to call the stunning art work. Right beside the dome, there is the beautiful bell tower, designed by architect and artist Giotti in 1359. The Cathedral can be visited free of charge. It is possible to buy a cumulative ticket that allows a visit in all of the sights and museums of the Dome complex; The roof top of Brunelleschi, The Baptistery, the Giotti Bell Tower , the Crypt and the Sacred museum. The ticket price is € 10 until the new grand opening of the sacred museum, the price of tickets will be € 15 after 29th of October 2015. 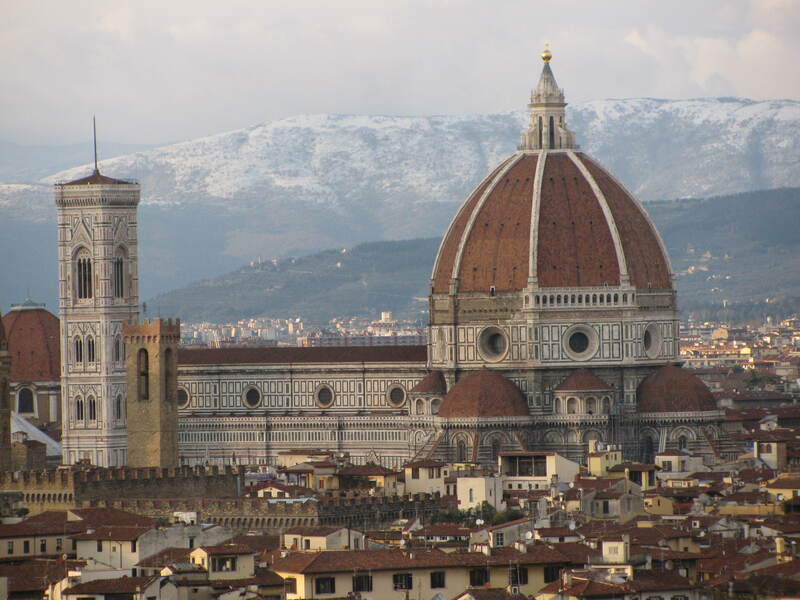 Cathedral of Santa Maria Del Fiore: 10.00 – 17.00 every day. Free entrance from the right side door from the main facade. 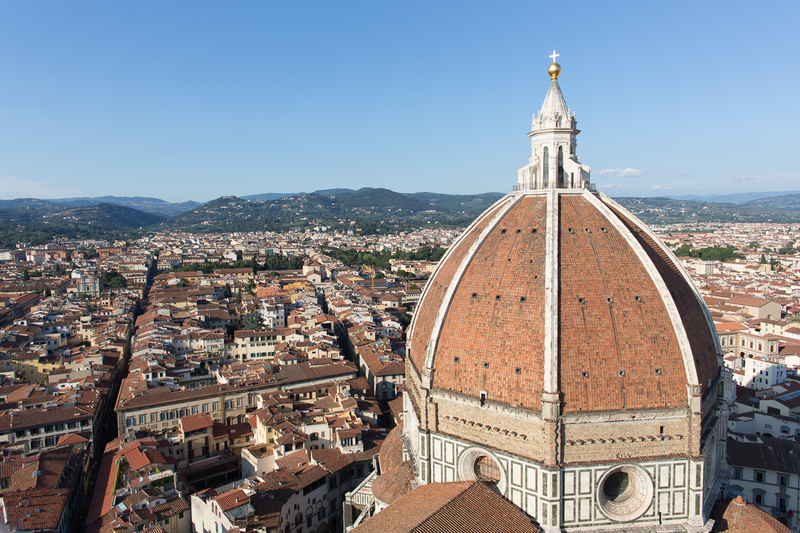 The Roof Top of Brunelleschi: 08.30 – 18.20. Cost: € 10. Entrance from the ‘Porta Della Mandorla’, left side of the main facade. 463 stairs to the roof top, no elevator. (Not suggested for people suffering of fear of hight, claustrophobia or medical conditions). Sacred Museum of The Dome: Opening 29th October 2015. 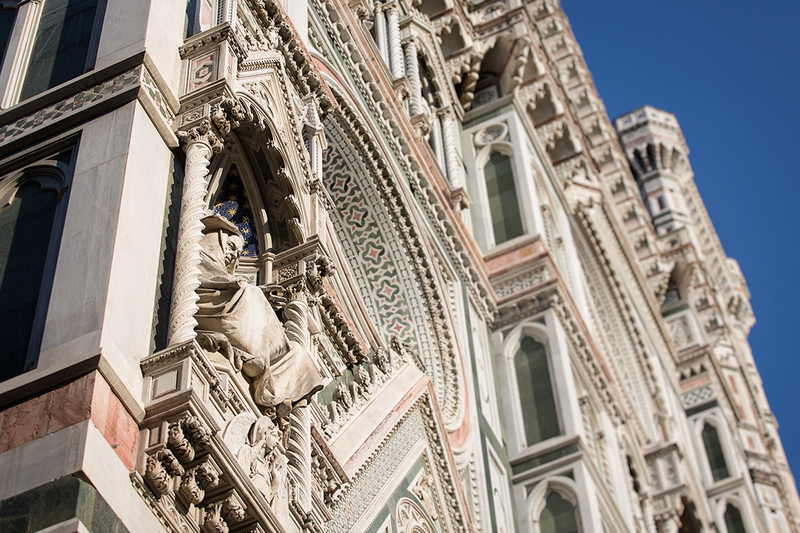 Prepurchase allows one entry to each site of The Grand Museum of the Cathedral of Florence. Ticket does not allow two entries to the same monument. Prepurchase does not allow the reservation of the entrance priority to any monument, but the beginning of validity of the ticket. Ticket must be used within midnight of the sixth day from the date selected for the visit on the calendar at the moment of the purchase, and it is valid for 24 hours from the passage at the first monument. Ticket contains a barcode readable by the turnstiles at the entrances of the various sites. The use of the tablet is not advised for reading difficulties of the bar code at the entrance. Customer with ticket must go directly to the entrance queue of each monument, without going through the cashier queue. Your ticket is personal and non transferable. PLEASE NOTE: Immediately after submitting an order, you will receive a confirmation email with links to the tickets. Please make sure that your anti-spam filter does not block automatic emails from us. Attention: the confirmation mail could take up to 1 working day to arrive, especially for large groups. Please Note: tickets have tax value so no additional invoice is issued. Tickets CANNOT be cancelled and are NOT refundable. Weekend a Firenze will only refund the entire cost of your ticket(s) including the service fee if the monument remains closed during the entire period of validity of the ticket(s). The monumental complex of Santa Maria del Fiore is above all a place of worship. Visitors are asked to respect some simple rules.